The beautiful, narrow alleys in this well-preserved old town create an exceptional view that is storybook-worthy. In fact, it has become one of the most beautiful urban parts on the island. Even in winter, this town is an attraction that only a few locations in Greece can match. This historic island in the Aegean Sea is famous for offering a huge selection of activities. At the same time, it features a dramatic landscape embedded in the mountainous area of Lesbos. A lot of water activities can be enjoyed in the island, as well as going to the beach and hanging out in night clubs. The largest island in the Cyclades is a gorgeous one that goes along with Mykonos and Santorini in the Aegean Sea. Although it is less an attraction in comparison to other places in the country, the island has a lot of natural diversity, coming from marble quarries, high mountains, and striking beaches. The town is popular due to its exceptionally gorgeous alleys. However, these alleys are closed due to traffic, which is indeed perfect for a nice walk. You can find a lot of cafes, shops, bars, boutiques, and restaurants, aside from the well-preserved Cycladic architecture that remains obvious in the alleys and walls. Another picturesque location that can be found in Crete is up on the northeastern shores. It is packed with attractions for guests, such as bars, cafes, restaurants, and shops to cater for the needs of the visitors. As one of the most famous towns in Crete, it should be worth the visit. This is situated in the little rocky island, which protrudes about 100m from the Myrtoan Sea. However, the small size has nothing to do with it being loaded with historic architecture. In fact, you can see the most significant pieces, such as the well-preserved Byzantine churches and medieval fortress. You have to love the houses situated at the slopes of Pezovolos Hill, where it has successful at attracting visitors in Epirus region. Aside from the historic architecture, you can see cozy cafes, great beaches with blue warm waters, and Venetian castles to name a few. The historic Plaka neighborhood was founded during the Ancient times at the northern slopes of the Acropolis. Despite being located in the country’s biggest city, Plaka gives you a feeling of slow tempo and small cozy town. Meteora simply means being suspended in the air. It is composed of an impressive monastery complex at the top of Mount Athos, built on top of the sandstone pillars. They almost look as if they are a natural extension of the rocks. The monument was made part of the UNESCO World Heritage Site, one of the most famous tourist attractions in Thessaly region. 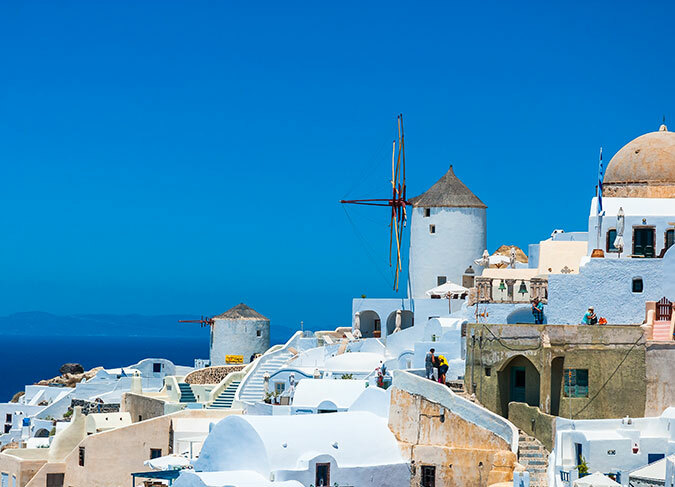 Arguably, Santorini is the most popular island in the region, which is an idyllic location for tourists. It has a postcard-worthy landscape that features dazzling white houses, historic windmills, chapels, and huddled on a hill, among others. It is also a famous destination for tourists all year long because the island comes into a climate zone close to a mild Mediterranean nature.